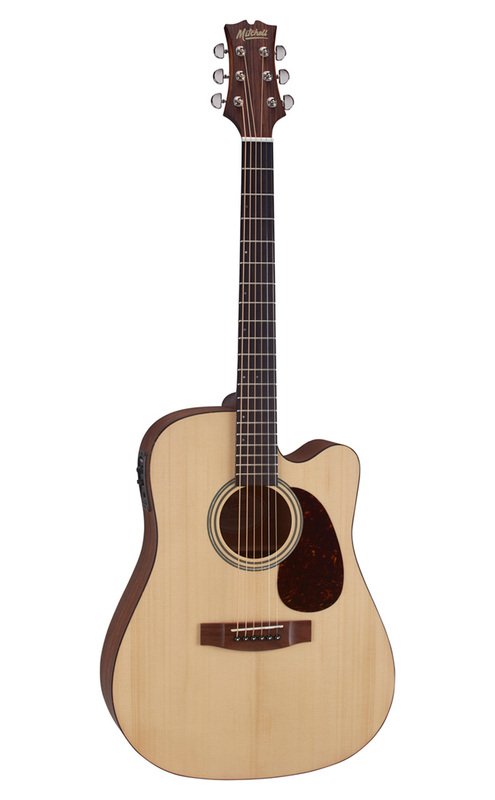 Mitchell has launched its new Terra Series acoustic and acoustic-electric guitars, including five models: the T311CE Dreadnought Cutaway Acoustic-Electric, T313CE Auditorium-Size Cutaway Acoustic-Electric, T331 Dreadnought Acoustic, T333E-BST Auditorium-Size Acoustic-Electric, and T333CE-BST Auditorium-Size Cutaway Acoustic-Electric. All Terra Series guitars feature a mahogany back and sides for a warm, rich sound; a mahogany neck with rosewood fretboard and bridge; and an open-pore satin finish and forward-shifted X-bracing for deeper overall resonance. Their comfortable, slim-neck design enhances playability, while high-ratio, sealed-gear tuners ensure quick, accurate, and stable tuning. All four acoustic-electric models come equipped with genuine Fishman Presys preamps and Fishman Sonicore pickups for full sound reproduction. The Terra Series T331, T333E-BST, and T333CE-BST are Mitchell’s first-ever guitars with solid mahogany tops, as well as mahogany backs and sides, for truly exceptional tone quality. The only all-acoustic model in the Terra series, the T331 delivers plenty of volume, as well, thanks to its dreadnought design. The T333E-BST and T333CE-BST are auditorium-size acoustic-electric instruments, and the T333CE-BST sports a cutaway for easy access to the upper frets. 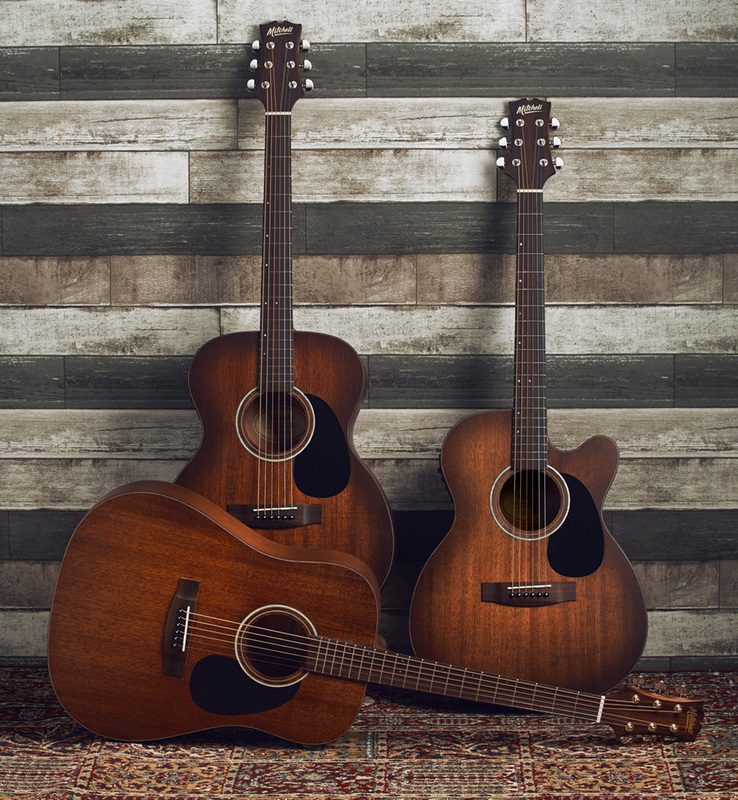 The Terra Series T311CE and T313CE acoustic-electric guitars feature a gloss finished, solid spruce top for detailed high end, along with a cutaway for the ultimate in playability. The T311CE is a dreadnought design, while the T313CE is an auditorium-size instrument. With their easy-to-play slim necks, quality woods, and overall design, the Mitchell Terra series are head-turning instruments that are unmatched in their price class. Before delivery to dealers, all Mitchell electric guitars receive a complete stateside setup and quality-control inspection to ensure exceptional playability. These fine guitars are available immediately at U.S. street prices of: T311CE $279.99; T313CE $279.99; T331 $199.99; T333E-BST $269.99; and T333CE-BST $299.99. Get your hands on the new Mitchell Terra-series guitars at Guitar Center or Musician’s Friend or visit www.mitchellguitars.com for more information.